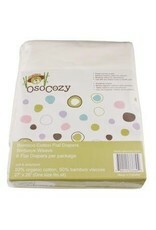 Our Bamboo-organic cotton flat diapers are 50% bamboo and 50% certified organic cotton. They measure 27 by 28 inches and are 1 layer thick. These diapers will shrink when washed to about 26 inches by 26 inches. The bamboo gives the diaper extra softness and absorbency, while the added organic cotton makes the diaper sturdy and long lasting.